In the last thirty years, four writers of travel and exploration have endeared a vast cross - section of readers the world over. Eric Newby’s narratives of routine encounters laced with subtle humour in A Short Walk in the Hindu-Kush won him a huge readership. Next on the scene came Bruce Chatwin whose first book In Patagonia was undoubtedly the work of a born, gifted writer. A pity that death snatched him young; a year before he was even fifty. All his three books won recognition: In Patagonia, a prestigious first book award, the next became a Hollywood film and the third was short-listed for the Booker! How handsome, dignified and self-possessed are these Laotian men, women and children. John Keay and Peter Hopkirk are both engaged in writing on the history of exploration in the nineteenth century. John Keay was attracted especially by the explorers of the Himalayas and made his debut with When Men and Mountains Meet in the 1970s followed two years later with The Gilgit Game. He moved on to narrate this history in its entirety with The explorers of the Western Himalayas in the 1980s. Mad About the Mekong is the latest from John Keay, recreating the dreams, tribulations, treachery, success and tragedy concerning the exploration of the Mekong river by the French in 1866-68. Was this exploration exceptional and why should any one want to read about it? Well, John Keay has little difficulty to provide an answer because he has had access to the most vivid and voluminous account written by Francis Garnier for the French Govt in 1869-70. And Delaporte, an outstanding artist who was especially included in the team left paintings and sketches of excellent merit in the hundreds. 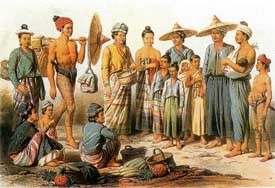 In order to understand at first hand the obsession of the French explorers with the Mekong, John Keay and wife Julia teamed up to navigate the river for about 600 km upstream of Saigon, covering in one week using modern crafts where the explorers mostly in indigenous boats had taken over two months! Now John Keay has fashioned all this material and personal experience into a vibrant narrative which seduces the reader at the very first page both with its fluency and sense of anticipation. In one of his other books, India Discovered, John Keay calls the 19th Century the Age of Exploration. The Americas, the Poles, the African Continent, the Middle East and South Asia all had been playgrounds of explorers. Where SE Asia was concerned, the French alone had maintained a token, low key presence. To consolidate that French presence, was born this idea to explore the Mekong for navigation upto where it entered Yunan, for commerce with China. If possible to explore it all way to its source in Tibet and in the process bring all of Thailand, Cambodia, Laos and Vietnam under French influence. In other words, sow the seeds for the eventual creation of the French Indo-China. The Mekong was considered the "Wildest of the world’s great rivers and until 1998 the Mekong boasted of not a single bridge across it, let alone a city on its banks." From its source some 500 km NW of Chamdo in Tibet, the Mekong flows for nearly 4,800 km upto Saigon. As the French set out to explore it upstream it involved getting through "the equatorial forests of Cambodia and Laos, to climb from the badlands of Burma onto blizzard swept tundra along the China-Tibet border". The Expedition had set out on two naval gun-boats but barely 50 km upstream because of unnegotiable cataracts they had to be abandoned for smaller steamers. Another 60 km they too had to be relieved by 20 country boats. Because of the ever changing hydro-geology of the Mekong river-bed the Expedition changed to smaller local river crafts almost every 40 km and in John Keay’s words "when boats got smaller and river more impetuous, they took to jungle, riding elephants, bullock carts and horses, mostly they sloshed through knee deep mud festooned with leeches". These frequent interruptions proved a boon to Delaporte the artist who painted and sketched the Mekong and life around it with gay abandon. He was obviously a man of refined sensitivity as all his sketches and paintings show-case only the very best of the ancient SE Asian art and architecture and refinement and culture of its inhabitants. On the first sighting of Angkor Wat, it was Delaporte who called it "the Budhist Notre Dame.. more like a living fairy tale" and he goes on to depict that in his sketches. Garnier, the Deputy leader and the chronicler wrote of Angkor Wat: "Perhaps no where else in the world, has such an imposing mass of stone been arranged with more sense of art and science...a spark of sheer genius....what grandeur and at the same time what unity..." Garnier’s narrative and Delaporte’s art together resurrected Angkor Wat from ruin and decay to restoration and eventually a World Heritage status. The expedition found that Vientian, the ancient capital of Thailand was also mostly a heap of ruins by then. So they had non of the ceremonial welcome which was accorded to Von Wuystorff in 1600 AD, recounted thus by John Keay:" the most magnificent walled city in all of SE Asia.... He was conducted upriver in a fleet of royal pirogues and then... a procession of 3,000 richly caparisoned elephants and a like number of the king’s body guard... one elephant was solely for carrying the vast ewer of solid gold in which his letter of accredition was deposited...!" What a refined civilisation and what riches! The Mekong was for ever challenging the perseverance of the explorers. But neither history nor the locals had prepared them about the sheer immensity of the Khon Falls, the third largest in the world and " when in flood, probably the largest. Niagra has about a 1/4 of their volume and Victoria Falls only an 8th." The River had proved un-navigable especially for substantive commerce. It would have been logical to call off the expedition at this stage itself but the obsession of getting as far up-stream as possible, the undeclared deeper political grand design and the desire to enter China via a route that no white man yet had, outweighed all pragmatic considerations. A century later, when Ruth Padel scanned the Mekong forests along 400 km of the river, for evidence of tiger she found none. There was little of any wildlife altogether. Little wonder that Garnier was to record that,".... each bend of the Mekong...came to possess me like a monomania. I was mad about the Mekong...." In all, the Expedition covered 11,000 km, surveyed and mapped 6,000 km of virgin territory, chartered the precise course of the Mekong river upto Jingbhong where it enters Chinese Yunan, that is approximately half its length and recorded all its tributaries. The Mekong explorers had "out-marched David Livingston and out-mapped HM Stanley". Sir Roderick Murchison, President of the Royal Geographic Society, London when presenting its Gold medal to Garnier called the French venture," one of the most remarkable and successful explorations of the 19th Century... But it was the sheer scale of the thing that was the hardest to take in." Basking in the glory of deserved recognition, Garnier got married. They had a year old child when the Mekong ‘monomania’ engulfed him all over again. So he was gone to Peking, this time to get to the source of the Mekong in Tibet first and then work down the river to Saigon! he led himself quite unnecessarily into an armed skirmish before setting out for Chamdo and perished unsung in a nameless muddy ditch. His wife had his body laid to rest in France but there is no monument to remember him by, neither in Saigon nor in France. Strange are the ways of destiny.